A man and woman from Columbus were arrested Tuesday on multiple drug-related charges following a traffic stop on I-65 in southern Jackson County. Gregory Scott Nasby, 53, Columbus, Indiana: Dealing in Methamphetamine – a Level 2 Felony, Possession of Methamphetamine – a Level 3 Felony, and Dealing in Marijuana – a level A Misdemeanor. Theresa Marie Burns, 46, Columbus, Indiana: Dealing in Methamphetamine – a Level 2 Felony, Possession of Methamphetamine – a Level 3 Felony, Possession of a Hypodermic Needle – a Level 6 Felony, and Dealing in Marijuana – a Level A Misdemeanor. The stop occurred when Senior Trooper Mark LaMaster from the Sellersburg post All Crimes Policing (A.C.P.) Squad observed a white Ford Pick-up truck northbound near the 41 mile-marker with possible false or fictitious plates and also for following too closely. The A.C.P. 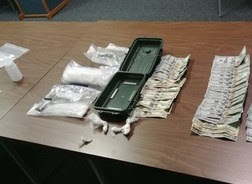 Squad is an eight-member team which focuses heavily on drug investigations and interdiction in the Sellersburg District. On Tuesday the squad was conducting traffic patrol in northern Scott and southern Jackson Counties. After stopping the truck, Trooper LaMaster continued his investigation and requested the assistance of Master Trooper Nathan Abbott and his assigned K9, Teague. Teague alerted on the vehicle, and a subsequent search revealed approximately one and one-quarter pounds of suspected methamphetamine hidden underneath the truck. Troopers also confiscated a small amount of marijuana, a syringe and over $4,500.00 in cash. Both occupants of the vehicle were arrested and transported to the Jackson County Jail.